Will there be truffles ahead or squeals of delight for celebrities down on the farm? | News by Wales Express News, People Before Profit! A group of Welsh celebrities had a “swill” time down on the farm with the help of Europe’s largest trailer marker. The stars of music, drama and broadcasting took nothing for “grunted” as they tried not to make a pig’s ear out of a challenge in the latest series of the hit TV show, Fferm Ffactor. 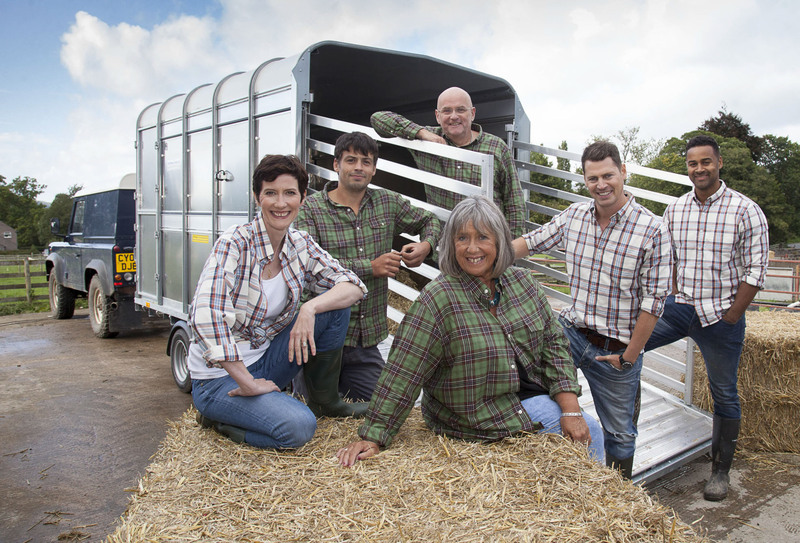 The celebrities have brought a twist to the programme, produced by Caernarfon-based Cwmni Da for S4C, which previously featured real-life farmers. One of the tasks in the opening episode of the new series was to drive a pair of porkers through a tricky course at Coleg Cambria’s Llysfasi site near Ruthin and load them onto a livestock trailer from Ifor Williams Trailers. Every twist and turn was captured on camera under the watchful eye of judges Caryl Gruffydd Roberts from Llanrwst and farm business lecturer Wyn Morgan, along with show presenter Ifan Evans. Fferm Ffactor Selebs will be shown on S4c at 8pm on Tuesday, February 6. Among the contestants was Cefin Roberts, the conductor of the hugely successful Cȏr Glanaethwy from Bangor who came third in Britain’s Got Talent. He teamed up with Linda Brown, who works as an administrator at the pioneering theatre company, Theatr Bara Caws, and their captain Ioan Doyle who’s known as TV’s Climbing Shepherd. Cefin felt confident going into the challenge and said: “I was born and raised on a farm holding outside Llanllyfni so I’m not unacquainted with this kind of life. Linda Brown, from Gerlan, near Bethesda, who’s also known as the star of the S4C comedy series, ‘Run Sbit, was less comfortable being a piggy in the middle. Their team captain Ioan Doyle, from Nantperis, was there to give them plenty of tips so they didn’t have to make up their tactics on the hoof. He said: “I knew Cefin and Linda before. They’re fun to be with so we’re having a great time. TV and radio presenter Alun Williams, who comes originally from Rhuddlan, is used to hogging the limelight but was way out of his comfort zone. He was teamed up with former rugby star Nathan Brew and their captain, radio and TV presenter Elen Pencwm. Alun said: “Being a television presenter is much easier than this. Doing live stuff is not a problem – all you have to do is read an autocue or learn a script. “This here is real life farming is hard work and I have a lot of respect for farmers. “I’m a little bit scared of because they make a lot of noise and they squeal. Nathan, from Swansea, who has one cap for Wales and played with Gwent Dragons for seven seasons, is now the Head of Commercial at the Scarlets where he also played for one season. He said: “I have to say, the two things I hate the most are animals and being dirty so this doesn’t suit me but this is an amazing experience and I’m looking forward to it. Elen Pencwm, who lives in Llanfihangel y Creuddyn, in Ceredigion, was looking forward to getting stuck in to some “porklife”. She said: “I know Ifor Williams’ trailers because I was raised on a farm. Presenter Ifan Evans’ day job is as a proper farmer in Pontrhydygroes, near Aberystwyth, and he had no time for any of the contestants wanting to wallow in self-pity. He said: “I try to keep order of things but it’s more of a job this year with all the celebs. Judge Wyn Morgan, who works at the Harper Adams University in Shropshire, was determined to be fair and not to make any “rasher” decisions. He said: “This series is very different to the two others I have worked on. Andrew Reece-Jones, the design engineering manager at Ifor Williams Trailers, said the company was delighted to once again help the Fferm Ffactor production team. “Our livestock trailers are well known to farmers across Wales and much of the world but they won’t be so familiar to celebrities taking part this year. Previous articleDigibyte Update – Why Timing Is Everything (DGB). Using a Blockchain which is 40 times faster than Bitcoin.